Home gym benefits: saves time, money, not having to wait to use equipment, the pride of ownership and having your own judgement free zone are few obvious benefits of investing in one. But is it worth the investment? What is the minimum barrier to entry in getting the equipment I need? How do I maximize my money spent? There are a ton of questions to ask. It can be a daunting process for you. So that’s why I wrote “The Ultimate Guide to Starting a Home Gym.” To take you step by step through one of the best purchases you will ever make. After reading this guide, it should clarify to you what you’ll need to get started. Which pieces of equipment are essential and which are complementary. What to look for regarding quality, features and initial investment. And whether or not the investment makes sense. So who am I? I’m Kaevon, owner and founder of this here site. I’ve been pumping iron for 20 years, from strongman to yoga, I’ve trained, competed and loved my fitness journey that’s taken me from prepubescent pipsqueak to competitive athlete to washed up meathead. And I’ll be using a combination of my home gym journey, industry knowledge and training experience to show you the way. The first and perhaps most apparent benefit is the chance to save money. Buying home gym equipment is an investment. The upfront cost of setting up a home gym is undoubtedly more expensive than a monthly gym membership, but that only applies up front. As time passes, you start to see net savings from that original investment. If you look at the cost of paying your gym membership every month and you multiply that over a number of years you can determine whether or not it’s a smart investment for you. For most people, your ROI will fall somewhere between two and six years. Of course, these numbers will change depending on where you train currently and what kind of equipment you end up buying. 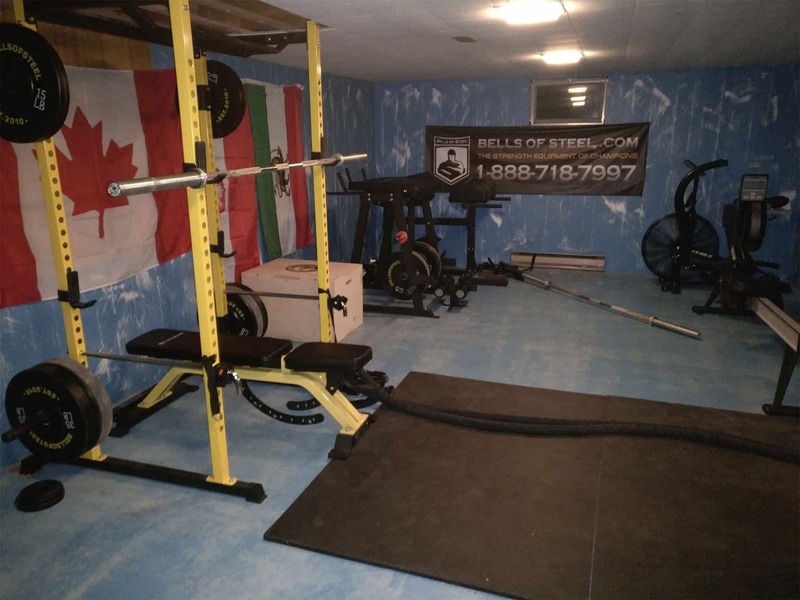 The good news is that the core components of a garage gym are made of steel and typically last a long time. And, if you know what to look (this is where this guide comes in handy) you’ll find most equipment comes with a lifetime warranty, which means you won’t ever have to replace much of your set up. But as nice as saving money is. And it is great. I would rank it near the bottom of the totem pole when it comes to the benefits of a home gym. I don’t have kids yet, but I have kids coming, I run a business, I train, I do lots of things. So time and access to a training facility are paramount. Even if you go to the gym and train for as little as 30 minutes and do a quick circuit, you still have to factor in the time it takes to drive to and from the gym. Finding a Parking Spot. Getting dressed. Getting your stuff ready. And so on. So even at the bare minimum your average round trip plus gym time is well over an hour. Whereas when you train at home, you just roll into your gym. You can wear whatever you want and jump right into your routine. When I was in my 20s, my career hadn’t started and I didn’t have a family, spending three hours a day at the gym was the highlight of my day. I’d have spent more time there if I could have. But now that I’m full swing in my career those hours are precious and I need to maximize my daily routine. A lot of people think this just speaks to women. There are a lot of women’s only fitness centres. And even when I was doing some of my surveys one of the biggest things that came up for women, why they train at home was that it’s judgment-free. However, for men, this is the case too. But not quite in the same way. For men, there’s a slightly different kind of judgment. Men tend to want to show off. Your buddies are watching how much you bench, and you can end up doing stupid things and getting off your regimen in the process. I’ve hurt myself on a number of occasions by doing things outside of my programming. Weekly 1rm max benches were not uncommon in my 20s, and your inner caveman can take over in place of good solid long-term progress. So being able to workout in a judgement-free environment is important for both sexes. Another big thing is access. Maybe where you live you don’t have a decent gym nearby. This has become less of an issue over the years as it seems like every day fantastic, well-coached facilities are being opened. While many of these gyms are top notch, they typically run off of a semi-coached business model and $200 a month membership is not uncommon. Often times, the best ones are located in industrial areas of the city where space is cheap and you’re going to find yourself wasting precious time driving too and from the gym. But I remember BACK IN MY DAY gyms with bumper plates were a thing of fairy tales and sneaking in chalk got me kicked out of my fair share of rec centres and that’s still the case for many parts of the world. I am of Persian descent and in Iran, there are ancient gathering places throughout the country, so called “House of Strength” that people train at and do traditional movements. Physical preparation is ingrained in the culture and is considered patriotic. It’s that culture that you can create in your home gym to make the physical act of working out more spiritual. I have the music that I like to listen to when I train, I have my flags of my heritage and of course the Canadian flag. I’ve put up gym shirts from around the world from where I’ve trained. I set up my environment, my “House of Strength” just the way I like it. Now my gym is a place I want to spend time in, and there is a particular pride attached to having created that. One of the most common questions I get when outfitting a gym is what’s the “best” equipment to get for my home gym. My total cop-out answer is; it depends on your goals. A weightlifting bar doesn’t make sense if you train 5/3/1, a kettlebell is of more use than a plyo box to most. The great thing about having your own gym is you can allocate your funds to the products that are going to help you personally. Equipment that is going to help you become the best athlete as opposed to going to a public gym that has a hundred thousand dollar worth of cardio equipment but they don’t have a needle bearing bar or bumper plates. So those are a few of the most prominent reasons that people make the switch. There are countless other personal motivations as well, but I think another important thing is to understand why NOT to get a home gym. Of course, you can have training friends come over and train with you but if you’re a member of a gym and you have a gym buddy, or you’re going to CrossFit classes you have that accountability. When you are at home, and nobody’s there to keep you accountable, for some people it can be tricky to stay motivated. Try using an accountability app or getting a training partner for home. Socializing is a big thing that I miss out on now that I train at home. I used to love going and gym and trash talking/encouraging/catching up while I trained. Consider training at home with your spouse or getting the crew over for a lift once a week. This is becoming a thing of the past as we are seeing strong growth in the online coaching space but having a coach is extremely helpful. I’ve been working out for 20 years, and I still try to keep a coach. I’ve been very successful on my own as well, but I do see a marked improvement whenever I have a quality coach on hand. Bells of Steel has just rolled out our coaches catalogue, click here to check it out and see if it’s right for you. This is actually how I started training at home before I owned a house and can be an excellent transition and a great way to test if working out at home is right for you. It also allowed me to keep more consistent with my workouts as I got busier and had to cut my in gym training down. The glute loop – portable and perfect for training the stubborn to grow glutes/hips. 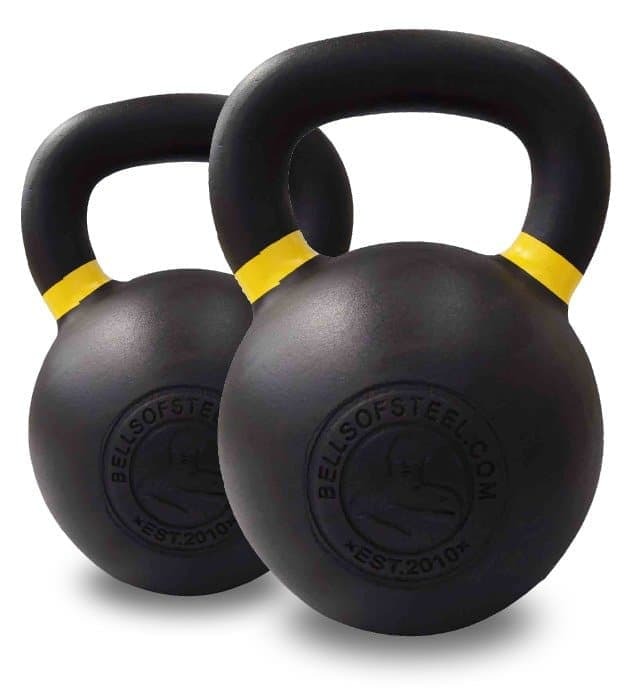 Kettlebells – 8kg for a beginner women, 16kg for a beginner man. You can use a kettlebell to accomplish literally hundreds of different workouts and if you sign up for our newsletter we’ve got 2 intermediate ebooks and 1 video series for beginners. 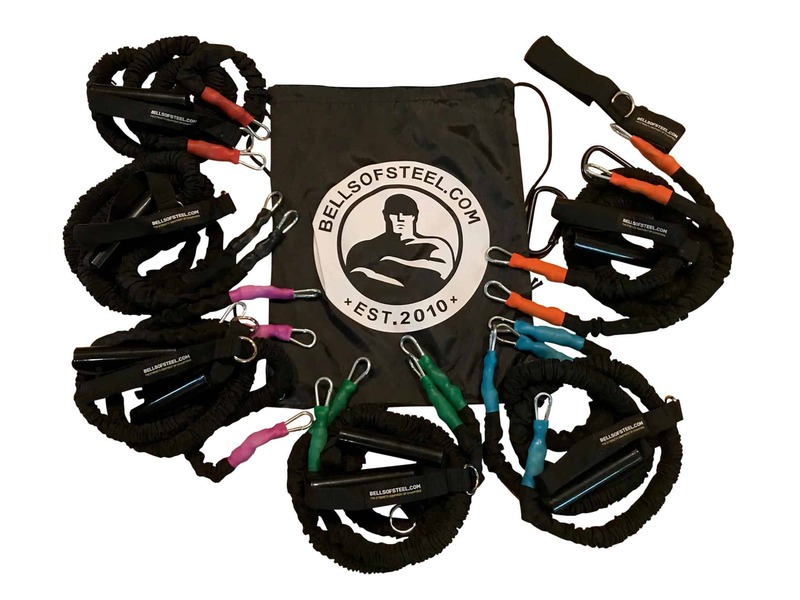 Cross cord travel pack – comes with a door anchor and you can use them for almost anything you could use dumbbells for, not to mention they’re perfect for rehab/prehab training. In this section, I want to give you as unbiased an opinion as possible. The goal is to provide you with a full spectrum of brand equipment that you’ll find available for your home gym. While I do sell equipment, I would much rather you purchase from a competitor and use the equipment than not to be working out at all. I peg our business model at Bells of Steel as kind of that middle sweet spot. High value for money. We’re not the cheapest stuff around. We’re not the most expensive stuff. We try to deliver a lot of value. This is the type of stuff you might find at a big box store. They’re made as cheaply as possible. It does the trick, but it won’t have a lot of features nor will it last long especially if you progress quickly into lifting heavier. I used this stuff when I first started on my home gym journey. Back before I owned a fitness company. I bought some cheap stuff online, and while it did get me started, I broke down rather quickly, and I had to buy all new equipment. If you take your home gym training seriously, I don’t recommend this. Not only does this type of equipment lack versatility but the safety features are almost none existent. It could be an option if you’re going to keep your gym membership and you need a basic set-up for home. But again if you’re going to be training seriously in your home gym I would not recommend this type of equipment. This is kind of a sweet spot for companies that provide good quality home gym equipment at a reasonable price. This is often the type of equipment you’ll find in your local fitness stores, and it’s the type of equipment I recommend to most people because it provides the best value dollar for dollar. The difference between a five or six hundred dollar Power Rack and a thousand dollar Power Rack often isn’t much. You don’t need a rack that can withstand an atomic bomb. I would instead take that extra money and invest it in other products to round out my training. I see this all the time with commercial gyms. They have a $4,000 commercial rack with the $60 non-bearing, chipped up wobbly barbell sitting on it. It doesn’t make a lot of sense to me. I want a good quality rack that can handle my weight. That has some useful features on it. And then I want to put that extra money into a set of kettlebells or a glute-ham or reverse hyper or bands or whatever. In the top tier, you’re going to see a lot of domestic made stuff. Made in Canada or made in the U.S. And a lot of the European stuff falls into this category as well. Again being as unbiased as possible I can’t say this stuff doesn’t have its place if money isn’t much of a concern. Perhaps you have no budget, and you intend to throw some weight around then this is going to be the stuff for you. But again for me, the price difference doesn’t reflect the difference in quality and features you’re getting. If you have no budget, then I would say it’s the way to go. But keep in mind, if you have a $2000 power rack and you don’t have a reverse hyper. You don’t have kettlebells. Or bands. Or a glute ham machine. You spent all your home gym budget on a rack, that is a mistake that’s going to damage your training. A $2000 rack isn’t going to make you a better lifter. Whereas a $700 rack, a $700 reverse hyper and a $600 glute ham is going to make you a better athlete if you train home. So that gives you a decent layout of the variety that is out there. When starting a home gym, there can be some confusion around which pieces of equipment to invest your money. There is a lot of fluff out there backed by great marketing and a lot of different ways you can blow your budget buying unnecessary equipment. There are 5 core components that make up the cornerstones of an excellent home gym. In this section, I’ll outline what those 5 components are, which features to look for, and where you can save money so you stay within your budget. With these five pieces of equipment, you will get a massive amount of training diversity as well as provide you with a gym you won’t soon outgrow. Let’s look into each component a little closer. The Cornerstone of any home gym is a power rack, also known as a squat rack or power cage. This should always be your first step. And perhaps if you’re more into weightlifting you could go with a squat stand. A Power Rack is essentially a cage where you can adjust the height of your barbell and do compound movements in an enclosed, safe space. It allows you to execute major exercises like the squat and bench. The lower end Racks will provide merely that, while the mid and high-end racks will have many other features that help diversify your training. We’ll cover which features to look for later in this section. Regardless of what you’re squatting, 14 gauge steel in your tubing is the minimum requirement for a power rack or squat stand. Conversely, I don’t think there are many people out there that would ever need more than a 12 gauge. Even if you put a bar with 800lbs on a 12 gauge rack, it’s not going anywhere. 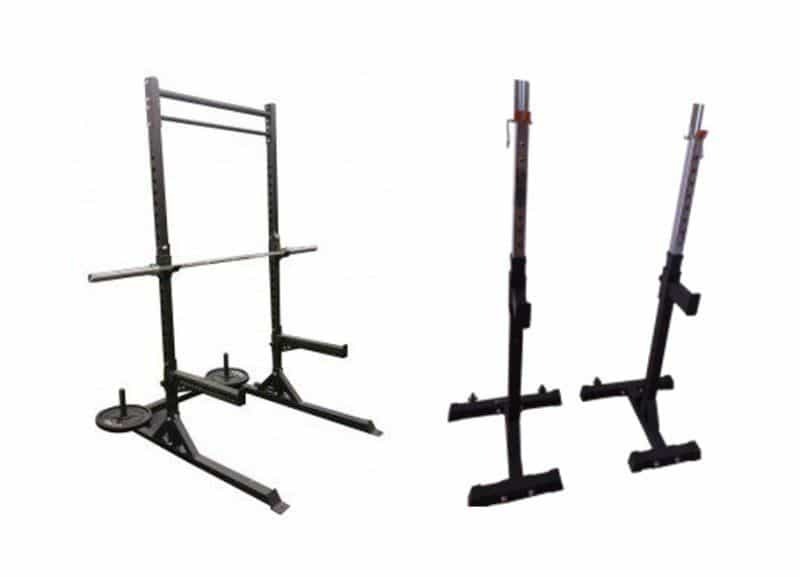 With some of the older and worse designed racks, you’ll see very wide, over 2″ spacing which can make a huge difference when you’re unracking your squat or bench. So look for a rack with max 2″ hole spacing. There is not a whole lot to go wrong with a Power Rack, but for your peace of mind, you should make sure your rack comes with a warranty. We offer lifetime structural warranty, as do many other companies so make sure you get a rack that includes one. Multi-grip pull-up bar, lat pulldown, safety spotter arms (canvas over steel), plate storage, numbered pin holes, close pin holes, room to place feet while squatting, band pegs, dip bar attachment, storage pegs, if they don’t come included it’s a good idea to look for rack that has the capability to be upgraded later. There’s a lot of features that can be built into racks that will save you money and space rather than having to buy the add-ons independently. I’ll use the example of the Racks we carry at Bells of Steel for comparison purposes. Our entry-level Rack. It’s pretty no frills. It’s the rack I have in my home gym currently, though I’ll probably be trading it for the Commercial Squat Rack. I brought it in because I didn’t have a Commercial Rack in stock and I just wanted to get a rack in my house. And to be fair, it’s served its purpose. This entry model rack can be seen in a few different forms on various websites around the world. A basic rectangular shape, it uses thinner tubing for the frame and has a lower weight capacity than higher-end models. It isn’t a feature rich rack which will limit the variety of your training, but for many of you, it’s all you’ll need. The main benefit (as of the writing of this article) of the Residential Power Rack is that at CAD $330 it’s half the price of the next rack up. 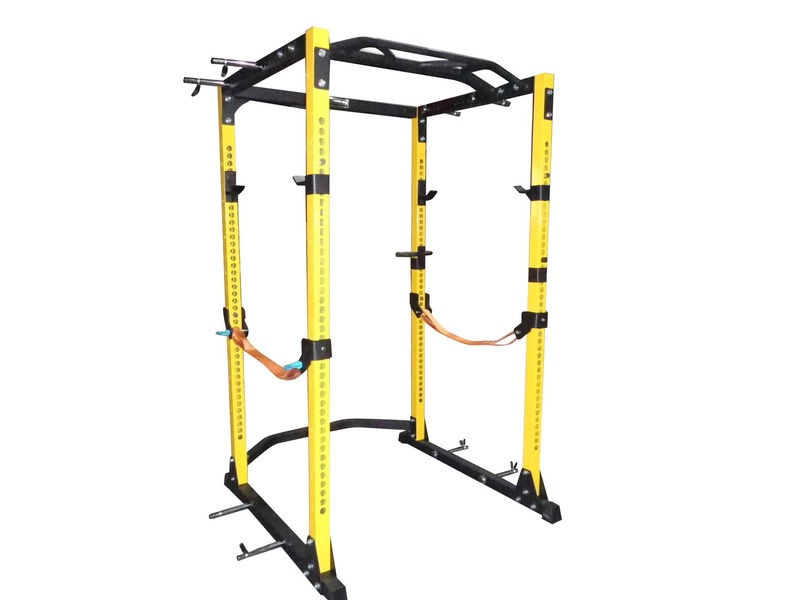 It’s an entry-level rack built and designed for novices, youth athletes and people not looking to push ultra heavy loads or to train with banded resistance, which is an important part of many powerlifting programs. Our next rack up from the Residential Power Rack is the Light Commercial Rack, and it has a ton of great features. It’s got thicker tubing and gauge, often this is what you’re paying for when you buy a more expensive rack. In this category of Power Rack, you’ll see weight capacities of 800 or 1000lbs. I don’t know many people training at home who squat more than 600lbs. If you’re trying for a 700+ lbs lift you should probably go for the top end stuff or more likely be training in a gym under a coach. Rather than just thicker tubing and thicker gauge steel I’ve added more features because I think that drives a lot more value, whereas a lot of racks will put their manufacturing costs into heavier duty steel. For example, the Light Commercial Rack has features you won’t see in any other comparably priced Power Racks, Band pegs, safety straps, rolling j-cups, laser cut and numbered pin holes, fat/skinny multi-grip pull-up bar, detachable dip bars, amongst others are built in by default. It’s jam-packed with a ton of features that you’ll grow to appreciate as you progress and I’d say feature rich racks are overall more beneficial to your training than opting for a rack with better steel. One other feature to look for is a bolt down or flat foot style rack. Bolt downs are becoming more common, though you don’t necessarily need to drill into your floor, it does make for a safer rack. When selecting a flat foot rack that doesn’t need to be bolted down, look for a U-shaped cross piece. 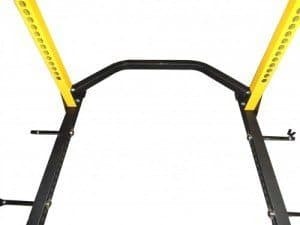 This allows you to unrack the bar while squatting without banging your toes or shins. I’m a big fan of the open style racks and you’re starting to see them less and less. The most significant reason is that I like to press overhead in racks, which can be limited in the closed style racks and how roomy they usually are. It’s also more of a nostalgic style. The Commercial Open Style Rack isn’t quite as feature-rich as the Light Commercial Rack, but it has thicker tubing, it’s an open rack, it’s bigger and has enough plate storage pegs for most setups. The Commercial Open Rack has a similar price point to the Light Commercial Rack it’s just a different style. For reference, the Light Commercial and Residential are our best selling and sell about 10 units per 1 of the Commercial Squat Rack. Racks like The Brute are what you’ll often see in a commercial/collegiate gym rather than in a home gym. They’re massive, indestructible and can easily have multiple people training on them at once. These racks are great where space is limited. Especially in a garage. The rack folds right into the wall so you can still park your car in the garage when you’re not working out. They do require some tools for installation but nothing too major. If you’ve never learned to properly dump a bar, or even if you don’t do high bar squatting, using squat stands can be dangerous. On one occasion I brought a friend to a weightlifting club, the guy was strong as an ox but had never used squat stands or dumped a bar, not in a rack. Well, he missed a rep and the bar rolled off of his shoulders and directly onto his lower back (about 450lbs). Needless to say, it was not a pleasant experience. While a squat stand can save you some money, the risk of injury isn’t worth the money saved. On top of that, you’re going to need to be able to dump on the ground which means you’ll need bumper plates. It’s a very bad idea to dump a loaded bar with steel plates. Not only is it dangerous it’ll damage your floor, bar and your plates. The ideal rack/stand hybrid for small home gyms where space is limited. These open style racks allow for quick transition from squats to bench, floor press to pull-ups, anything else your heart desires. They also bolt to the ground and is ideal for kipping pull-ups if you’re into CrossFit. So which rack should you choose? If it still isn’t clear which type of rack will serve you best for your home gym, here is a quick rule of thumb. If you don’t plan on training for and you don’t see yourself ever getting into powerlifting, go with the Residential. But if you ever plan on doing a powerlifting program or competing in powerlifting the Light Commercial is the way to go. The Commercial Open Rack you might purchase if you are doing more bodybuilding/old school style training. 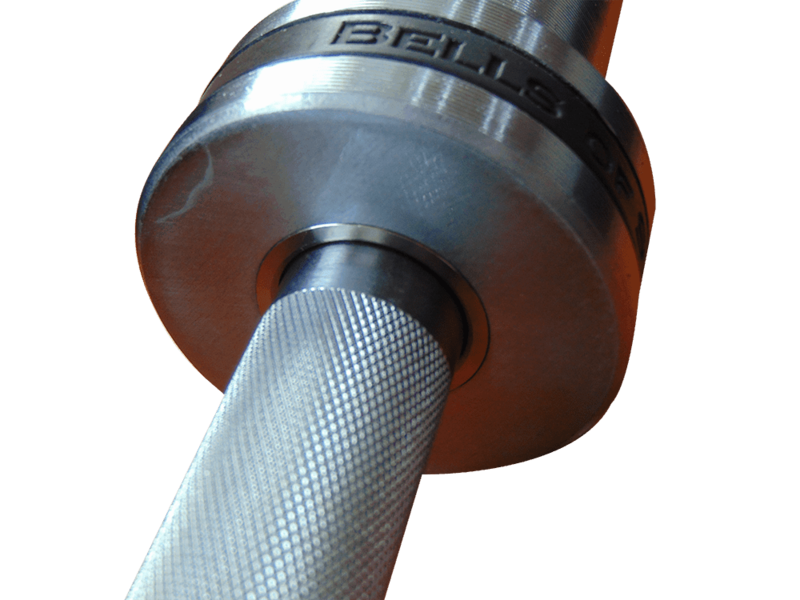 While the Brute would be for if you have a small club at your house or you want something for your commercial gym. Basic squat stands are really only recommended for oly lifters. Commercial squat stands are ideal for CrossFit. There are three main types of benches. 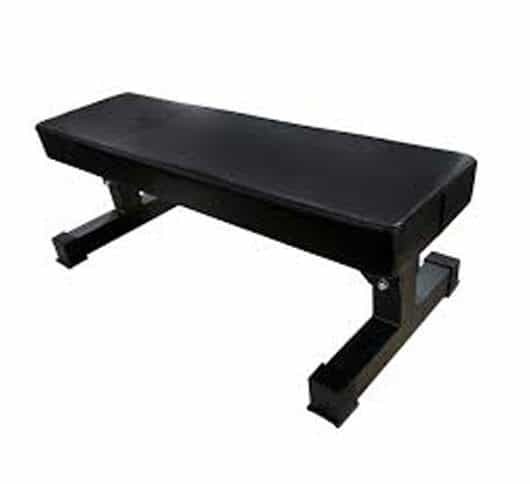 Your standard flat bench, an adjustable bench or an actual bench press that doesn’t require a power rack to bench in. The flat bench is self-explanatory. 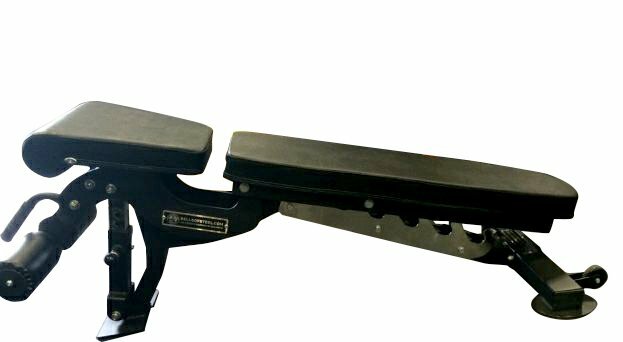 An adjustable bench is a flat bench that can be adjusted so you can perform military or overhead presses and in some models, decline for sit-ups and decline presses. I carry three models at Bells of Steel. A Flat Bench, an Incline/Decline Bench and a fairly unique competition bench/squat hybrid. Flat benches are what most people go with, there’s a pretty big price variance. But an incline/decline bench can give you a lot of variety in your training. You can do a lot of work with incline/decline benches including presses and overhead work. And they’re great for that. A standalone bench press isn’t terribly economical in a home setting, you see them more in commercial gyms. But if your primary focus is just the basic bench, you can save yourself some cash by getting a flat bench and a flat bench design is typically more comfortable for doing standard flat bench movements. To ensure your bench is easy to move, make sure it comes with wheels and a handle so you can move it around your home gym. As for other models out there, the fat pad is popular in certain circles. It features a thicker than standard pad atop the bench. The jury, however, is still out on them. A lot of people believe they can cause instability which can lead to injury and they don’t meet IPF (the largest powerlifting body) specs. So, for now, I don’t carry them, nor do I recommend them, but that could change with time as they are a relatively new design feature. If you look at a competition bench they have a minimal amount of padding and the pad is quite hard, and I think that is a very intentional reason from the IPF. Another feature to look out for is foot position on the bench. Typically you’ll see benches that allow for a narrower foot position or a wider foot position. I haven’t had too many benches interfere with my foot placement in my life, but it’s something to look for as I know that it’s a concern for some people. 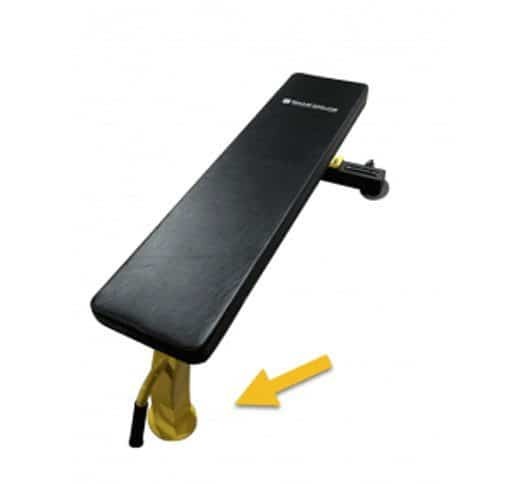 On our flat bench, we have one side with just one support pole going down, and that ensures the legs of the bench don’t interfere with foot placement during your bench press. If you weigh 200 lbs and you bench 200, that is 400 pounds loaded on your bench, so you don’t want something flimsy. One of the things that break down on cheaper benches is the pads. They can wear down, and split over time, and that’s where a better quality bench is going to last longer. The foam and the vinyl are a more durable material than the cheap benches. The last thing you want is your pad to split six months in and you’re left with a scrap of useless metal as it’ll likely cost more to re-upholster it than to buy a new bench.